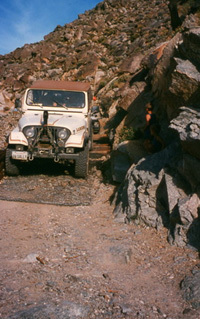 Del's old Jeep, DV Sally, negotiates the rock ledge of South Canyon Park Bridge, built by volunteers and restricted to a 6,000-pound weight limit. Nestled in the trees high up in Pleasant Canyon, Rita's Cabin makes a great lunch stop. Always treat cabins and any historical structures with respect and care -- we want them there for a long time. Boilers, like this one at Clair Camp in Pleasant Canyon, are common sights in many old Death Valley mining camps. In Death Valley National Park, in the Panamint Mountains of eastern California, is a canyon loop road that takes four-wheelers through a harshly beautiful landscape and 150 years of pioneer history. Del Albright lets some air out of his tires and heads down the trail. Movement caught his eye. A slight desert breeze cooled the air on this high mountain pass. The Indian and his son stood motionless, squinting across the vast desert in the bright sun. Then the sun glared off something moving, something shiny and out of place, way off across the distant valley. Neither of them had ever seen anything like this. The young boy looked up and asked his father what was coming toward them. "White men," was all he said. It was the middle of the 1800s and the Death Valley '49ers were headed for fame and fortune in the California gold fields. More than 150 years later, I got to spend a few nights around a campfire with Dugan Hansen, the grandson of the young Shoshone Indian boy who witnessed the first white men coming down Furnace Creek Wash into Death Valley. By the time I met Dugan, his weathered Native American face sported a bright smile, and his eyes told tales his lips couldn't repeat. Probably in his 80s at the time, Dugan had lived in the desert most all of his life. He never ran out of stories or of tales of his grandfather. You can drive to the place where the Indian stood to watch the first white travelers in Death Valley. Today we call it Rogers Pass, and it sits at the top of Pleasant Canyon in the Panamint Mountains of Death Valley National Park, in eastern California. The pass comes about midway around a four-wheel-drive loop, a daylong drive through the Panamint Mountains, and it's worth every inch of the trip that traverses up Pleasant Canyon and down South Park Canyon. On our first late-winter trip through this loop, we experienced pleasure, pressure, prettiness and pucker. The loop begins at the ghost town of Ballarat in Panamint Valley; you'll find it south of Panamint Springs, north of Trona, off State Highway 178. Signs point the way once you get close. Be sure to check local conditions with the National Park Service or with the Maturango Museum in Ridgecrest before starting your trip. Road conditions change often and these desert mountains can take their toll on any trail at any time. Our trip began with a look-see at the Ballarat General Store. Lightfoot Louie was the caretaker on our first trip through (he's long gone), and there's no gas and not a lot left of this once-thriving mining town. We started our trip just south of the store, where it is easy to spot the road heading east up into Pleasant Canyon. This is the air-down point. Drop your tire pressure to something safe, but less than pavement pressure. I recommend around 20 pounds for most SUVs. You'll love the difference in your ride -- and your kidneys will thank you. Once you start climbing up Pleasant Canyon, you'll see the remains of gold mines that date from the turn of the 20th century, when hopes were high in the Panamints. Henry Ratcliff called his famous 1896 mine the "Never Give Up" claim. That same year, the Montgomery brothers opened the "World Beater" mine. Money was flowing. Well, perhaps what mostly flowed was sweat and blood. Most of the mines are abandoned and somewhat vandalized now, but gold still fires men's imaginations. Around that campfire years ago were a few local desert rats and miners still trying to make a living from the rocks. The firelight twinkled in the eyes of these old-timers as they laughed aloud at tales of themselves and their (mostly fruitless) search for gold. My guide at the time, John Hofstetter, better known as Ol' Saline, had spent 40 years exploring the desert. He quoted the old saying about Death Valley: More money went into the ground than ever came out. Most miners went broke, died or disappeared into the desert, and their ghosts still haunt the Panamints on the Pleasant Canyon Loop. As you drive further up Pleasant Canyon you'll come to Rita's Cabin, just off to your right, in the trees not far from the top. It's a great place for lunch. When we were there, the smell of the pinyon pines drifted in the air. At the top of Pleasant Canyon you'll find a wonderful metal plaque marking Rogers Pass. This is the spot where the Indian and his son stood; it is also the spot where John Rogers and William Manly crossed the mountains to rescue two families who had become lost in Death Valley in 1849. I have been there several times over many years and each time, my mind's eye takes me back to the time when the struggles to tame this great land were met with death at every turn. Yet man prevails. At Rogers Pass you turn right (south) and head for Middle Park, which in turn makes its way to South Park Canyon for the trip down off the mountain. The route is easy to follow if you stay tuned into your surroundings and follow directions, but keep your guidebook and map handy. The road down South Park is where the pucker comes in. About two-thirds the way down the canyon, you'll have to traverse a very precarious bridge along a rock ledge that has quite a drop-off next to your passenger door. It's scary but, boy, it is fun! The bridge was built by the "Friends of Briggs Cabin," part of the Bureau of Land Management's Adopt-a-Cabin program, and has a weight limit of 6,000 pounds! The cabin lies below the bridge and awaits you once you descend and start breathing again. This old road has a lot of history to it. Built by the folks who started the Thorndike Mine (located above the bridge), it was the route the mules used to haul ore down the mountain into Panamint Valley. The South Park road does some twisty switchbacks toward the end, but it's basically a safe trip back to the valley. You'll end up a few miles south of Ballarat when you hit level ground once again. The loop road can be traveled all year long, but do be prepared for snow on top of the Panamints during winter. Ice flows are likely in very cold weather along the Pleasant Canyon watercourses as well. Use your 4x4, carry the right gear and be prepared to hang out if needed. It's worth it!